Do you love your kitchen table, even though it’s suffered quite a few knocks over the years? Is your desk robust and practical with its heavy top, but rather outdated? Does your bedroom chest of drawers hold all your treasured clothing, but no longer match the color of your bed? Then it’s time for a makeover – transform your favorite pieces of furniture into real centerpieces of your home! 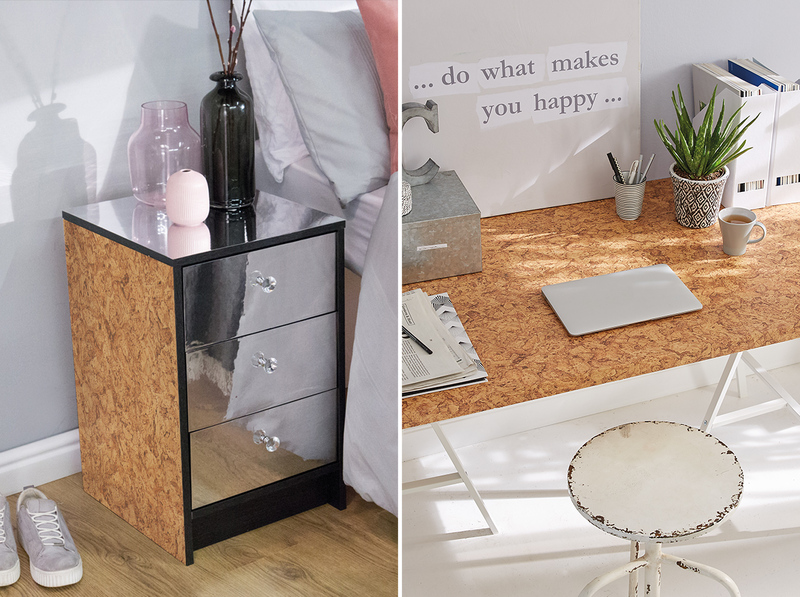 Because with the new and ingeniously effective Styling-Duo 2019 cork and mirror foil, you too can now become the designer of trendy pieces of furniture. All you need is a few of your favorite pieces of furniture, the d-c-fix® Segovia decorative foil with its modern, creative cork look and the d-c-fix® mirror-effect foil in silver. Once decorated with the d-c-fix® Segovia cork foil, the surface of your desk not only looks like new, but also exudes the vibrant, stylish, creative look seen in designer lofts. You can also beautifully highlight the visible edges of your tabletop using the mirror foil, which creates exciting lighting effects combined with a sense of depth. The back wall of a wardrobe or the front of your office drawer units can also be spruced up using the mirror-effect foil. The front of your bedroom chest of drawers will undoubtedly benefit from a cork effect, creating a modern, natural, creative style in your favorite room. And now that your styling creativity is in full flow, how about upgrading your black kitchen front panels with a modern, warm cork and mirror effect? You could apply the cork and mirror foil alternately to highlight the exciting contrast between these two effects. As you can see, you have 1001 wonderful options to give your favorite pieces of furniture a brand-new look – just let your creativity shine! Highlighting the visible edges of your tabletop using the mirror foil creates exciting lighting effects combined with a sense of depth.